How to Create a Pinterest "Product Board" That Drives Sales! Top companies are expanding their presence online and using Pinterest as leverage. And you know what? It works! Companies like Etsy, Free People, eBay, the Today Show, and Travel Channel delve into the Pinterest world, daily (click on any image to see their Pinterest profiles). Pinterest is a fantastic tool for branding your business. Companies that are using Pinterest right are creating a brand atmosphere… They are allowing customers and potential customers to observe and participate in the company vibe. When you go to the Etsy Pinterest page, you feel peaceful and creative. They have 90+ boards with a variety of topics; most notably are: “Cool Spaces,” “Videos We Love,” and “Love Letters.” Boards that are less plugging product, more creating an experience for the Pinterest user, are the most successful. Now, don’t get me wrong; these companies wouldn’t be using Pinterest if there wasn’t a completely amazing opportunity for eCommerce sales and product awareness! The Today Show for instance, though their boards are majorly composed of topical inspiration, have a few boards dedicated to the show; their “Kathie Lee and Hoda” board and “TODAY Anchor Antics” board create excitement around the show encouraging Pinterest users who enjoy their pinning, to participate in viewing their show. You can create a Pinterest profile for your business that inspires your customers and sells your products. 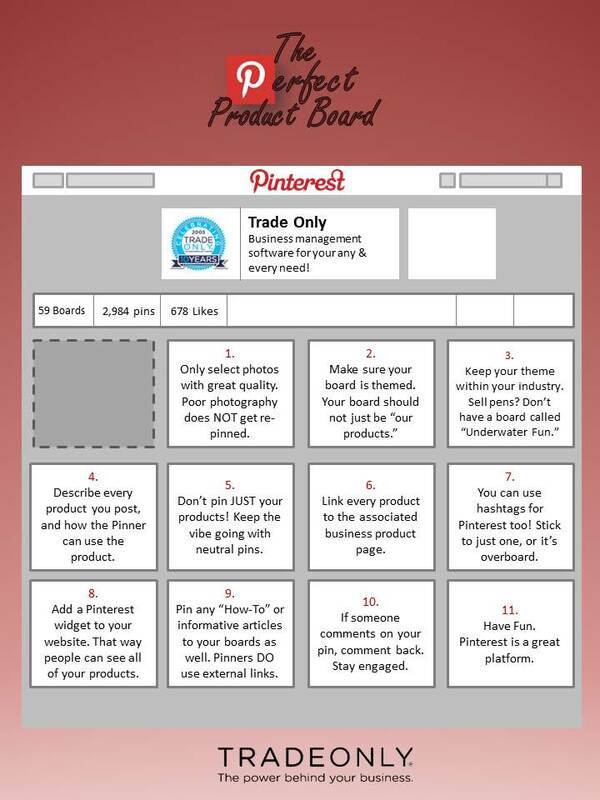 To help get your product page started up, here’s a guideline for posting to your product board(s) on Pinterest!